The Crossover 700SP cross trainer is very similar to the crossover 700, except its self-powered power supply. This elliptical cross trainer is also loaded with 23 workout programs, understandable in 13 different languages and equipped with many other advanced features like LCD screen, large and comfortable pedals, Double Hand sensor etc. 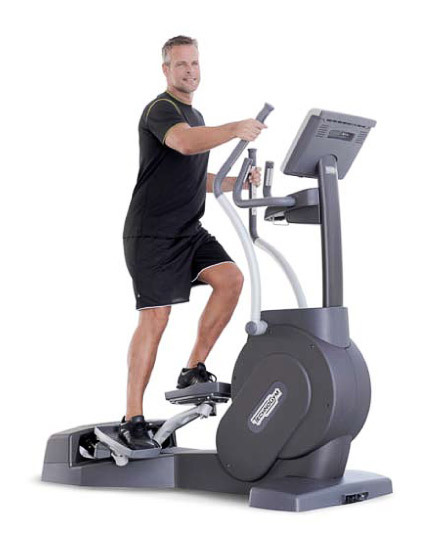 Crossover elliptical cross trainers are very beneficial for weight loss and improve balance. The biomechanics of a Crossover simultaneously involve the legs in extending, abducting, flexing, and rotating actions, consequently making it a favorable machine for professional athetics as well as general users. The latest cost of Technogym Crossover 700SP Elliptical Cross Trainer will be updated soon. *Note: Most of the sites, stores or shopping portals listed above sell Technogym Crossover 700SP Elliptical Cross Trainer with discounts and other exciting offers. There is a possibility that the some of above websites are not selling Technogym Crossover 700SP Elliptical Cross Trainer now. Toughtrain.com is not liable for such cases or instances. Also we do not recommend any seller for Technogym Crossover 700SP Elliptical Cross Trainer and a buyer should buy from where he/she gets best deal with quality of products, service and on time delivery (shipment).